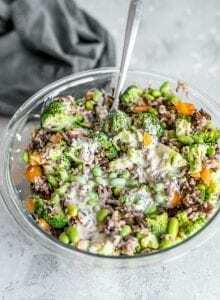 This healthy, protein-packed wild rice and broccoli salad is a great dish to make ahead of time. It works beautifully as a side dish or can stand alone as a nutritious and satisfying entree. Add all salad ingredients to a large mixing bowl and mix well. Whisk the tahini dressing ingredients together in a small dish then add to the salad and mix well. Serve right away or store in the fridge in a container for up to 4 days. The nutritional information listed below is if you make 4 servings out of this. For 6 servings, each serving would provide 298 calories, 8.4 grams of fat, 14.6 grams of protein and 42 grams of carbohydrates. To make this recipe stretch further, you can add an additional 1 cup of cooked wild rice. I’ve made it with 2 cups and 3 cups and both are good! If you’re adding 3 cups of rice, you’ll definitely get 6 servings out of this.